Irish fiddle player Brendan Tonra, born in 1935, grew up in Ireland in the rural village of Gowlaun, County Mayo, and emigrated to Boston in 1959. A renowned composer who wrote tunes throughout his lifetime, he published a music book of 88 original Irish dance tunes, including the set dance “Three Ducks and a Goose.” In November 2012 — in collaboration with his close friend Helen Kisiel — he released a new children’s book and CD called Three Ducks and a Goose: An Irish Tale and Tune. It would be his last publication before his death in 2014. Tonra’s story recalls a simple childhood memory — coming in from the rain and watching from the window as the ducks and geese splashed around the family farmyard. 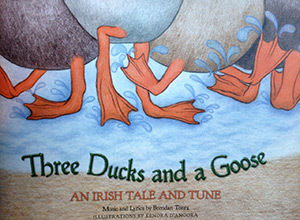 The book Three Ducks and a Goose includes wonderful illustrations by Kendra D’Angora, as well as the music notation to the tune, and an audio CD that features singing by the children’s choir of St. Margaret’s Regional School, of Buzzards Bay, Massachusetts, and the playing of Brendan Tonra (fiddle), Helen Kisiel (piano), and Kieran Jordan (step dance). At Helen’s invitation, Kieran choreographed a new “old style” set dance to “Three Ducks and a Goose,” using her feet sonically and visually to accompany both the melody and the story of Tonra’s imaginative tune. The video here of Brendan, Helen, and Kieran was an informal recording made in Helen’s Boston-area home. Three Ducks and a Goose is a favorite among young readers and a great choice for anyone who wants to sing, dance, or play along with this delightful original tune.